Moist forests and floodplains, ponds and wet areas in hardwoods, moist fields and fencerows, ditches. Distinctive in its rather stout, densely spreading-hairy pedicels; small white petals; and receptacle glabrous or nearly so. Some specimens of the yellow-flowered G. aleppicum may approach it in denseness of hairs on the pedicels. A single collection from Ontonagon Co. is intermediate between this species and Geum canadense in receptacle and stem pubescence, achene number in the receptacle, and other features. 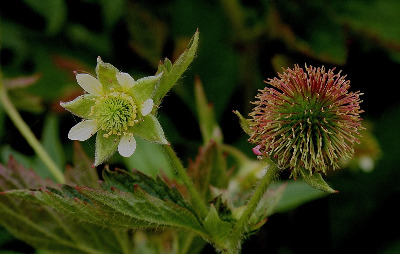 It is cited as the hybrid Geum ×cortlandicum M. Hough by Hough (2018). An old Wayne Co. collection by Farwell appears to be the same hybrid. MICHIGAN FLORA ONLINE. A. A. Reznicek, E. G. Voss, & B. S. Walters. February 2011. University of Michigan. Web. April 20, 2019. https://michiganflora.net/species.aspx?id=2486.